It was the perfect day for a beautiful salad! A salad is always the perfect opportunity to eat by color. Your health is determined by the foods you eat, and if you eat by color, you are ensuring a better health status. In fact, an easy way to get healthy or stay healthy is by eating different colored vegetables and fruits every day. This is because the colors of vegetables and fruits are the result of the make up of that particular vegetable or fruit; the colors represent the vitamins, minerals and phytonutrients contained in that vegetable or fruit. This is actually a very ancient way of eating, the Chinese culture thousands of years ago knew to eat a wide range of all the colors in order to be healthy. Baby field greens provide the basis for this varied color salad because there are a number of different field greens, just as the name implies. Some of the common greens in baby field blends are romaine, baby kale, baby spinach, baby arugula, curly endive, mustard greens, field lettuce or mizuna. Each is a different depth of green and supplies some variation in its phytonutrient content. The deeper the green the more nutrients the leaf provides. But overall, a mixture of the above greens will provide a good amount of Vitamins, A,B, C, E and K. And the phytonutrients are beta-carotene, calcium, magnesium,potassium, folate, chlorophyll and a large amount of lutein. Lutein is helpful in reducing cardiovascular disease and age related macular degeneration. Often there is raddichio, a deep red-purple color, in the field greens as well. These deep red colors providing Vitamins B, C and K. A nice combination of minerals in raddicho are manganese, copper, zinc and iron. Raddichio has a lot of fiber which is great for the intestines. And the phyotnutrients in raddichio are quercitin, lycopene,ellagic acid, and inulin. In other words, raddichio is very good for you! You can eat raddichio on its own too and reap even more benefits. Another not oft fount phytonutrient in raddichio is lactucopricin which has a little sedative and analgesic effects. Including raddichio in your menu often is a great way to eat by color since the color of raddichio is unique and its phytonutrients are distinctive. Raddicio is helpful in digestion, at keeping blood sugar levels stable and is a great source of fiber. Chopped red bell pepper brightens any dish and gives your body a heaping dose of several powerful phytonutrients. The color red is known for supplying lycopene, a powerful anti-oxidant that helps neutralize free-radicals. Lycopene is more effective than the other carotenoids. Lycopene shows a protective mechanism against heart disease by binding with LDL cholesterol and preventing it from attaching to plaques in the arteries, which would narrow the arteries. Lycopene also suplies carotenoids, Vitamin A and Vitamin C, which are very good anti-oxidants. The color red in vegetables and fruits also gives you manganese. 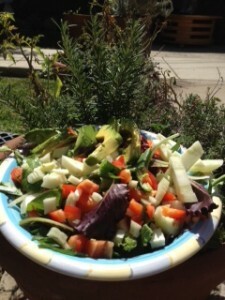 Two more greens to include in a meal if you want to eat by color are fennel and avocado. Fennel has been known for centuries as a carminative, a plant that prevents gas and helps bloating. Avocado is also a carminative so this salad provides you with 2 plants that will help your digestion. Whether you want to eat a fennel bulb or steep the seeds into a tea, either helps with digestion. Fresh fennel also provides a large dose of Vitamin C working as a strong anti-oxidant. Fennel is also known for having a strong anti-inflammatory effects in the body. Another great attribute is the fiber provided by fennel. Fennel can contribute to your daily requirement for fiber, which is important in keeping your intestines healthy as well as keeping blood glucose levels stable and helping to keep bad cholesterol down. And, as if that isn’t enough, fennel has shown anti-cancer abilities. A phytochemical in fennel called anethole inhibits tumor necrosis factor which is present in cancer cell proliferation. So many great benefits from fennel! and it tastes great! Avocado along with helping with digestion is a very healthy source of fats. Fats are vital to the immune system and the endocrine system. Fats are also utilized to make up part of the cell membrane. Avocados have been shown to help keep cholesterol low. Avocados have recently been proven to help reduce the risk of Coronary Vascular Disease. There are numerous phytochemicals in avocados such as glycosylated abscisic acid, which is anti-inflammatory and has anti-diabetic properties: cytochrome P-450, which is helpful to the liver in metabolizing thousands of self-produced chemicals and externally derived chemicals, as well as helping to synthesize and breakdown hormones…and the list goes on. It s such an extensive list, trust me – include avocados in your diet regularly. This salad is the perfect opportunity to eat by color to ensure you get a variety of nutrients. Think of it as a cross-training effect. The benefits from one of the ingredients has a potentiating effect on the other ingredients. One example of this is the effect of the avocado with the fennel. It has been shown that eating fennel with a healthy fat, strengthens its anti-inflammatory effects. My Full Body 30 Day Vegan Cleanse is full of recipes guiding you through how to make all of your meals just this healthy and colorful. Full Body 30 Day Vegan Cleanse takes you step-by-step through 30 days of every breakfast, lunch and dinner with different colors. There is no guess work and you will feel great!! It was a little experiment in the kitchen…and it was a successful one at that! 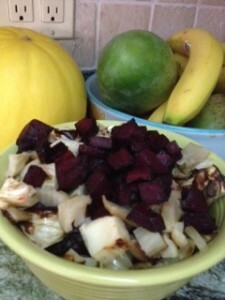 I made this roasted beet and fennel salad for dinner. For generations, beets have been known for their blood cleansing abilities, and fennel for its ability to aid in digestion. This was delicious as well as being perfect for all the benefits it gave to our bodies. Beets get their blood cleansing properties from powerful betalains, the pigments. It is these betalains that interact with oxidants, combining with the oxidants to render them harmless. This reaction appears to be protective for your DNA. Raw beets also provide oxalic acid, which is a powerful solvent of inorganic calcium deposits. This is also important because as inorganic calcium accumulates in the body, it becomes another factor in a number of disease processes. The oxalic acid also then has blood cleansing abilities. Beets also have the ability to lower blood pressure. Beets have a high amount of nitrates. In our body, those nitrates get converted to nitrites and then into nitric oxide. Yes, nitric oxide like that used when someone is having a heart attack. Nitric oxide expands the blood vessels. This is why it is used for people having heart attacks, and it is the same reason it reduces blood pressure. The more powerful effect is right there in the beets – the sum IS greater then the sum of its parts. The very powerful combination of betalains ,oxalic acid are the powerhouses with regards to blood cleansing. Then add in all the other very helpful vitamins, minerals and other phytonutrients, and you have a vegetable that should be a staple in your healthy diet! The other fabulous ingredient in this dinner is fennel. Fennel is wonderful raw or prepared umpteen different ways…how can you go wrong when fennel is in a dish? As an Acupuncturist/Herbalist, I am used to using fennel as a way to help people with digestive problems, (IBS, colitis, crohns disease…). Fennel gives us a good amount of fiber and vitamin C. Fennel also gives us potassium. manganese and folic acid. Since both beets and fennel provide our bodies with a great dose of fiber, this makes this salad great for your intestines. This whopping dose of fiber is exactly what is called for to help prevent colon cancer. Give this one a try! Enjoy! Heart Healthy Diet for my Boys! Everyday is the perfect day to have a heart healthy diet! This is how we live our lives and you too can have a heart healthy diet everyday. It is easier than you might think. Today is another wonderful day in the Ali home with lots of great food to eat! And a great heart healthy lunch for the beautiful boys to take to school. 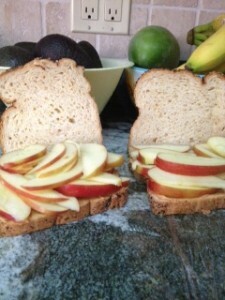 Yep, that is what you think it is…peanut butter and apple sandwiches!!!!! Yum!!! Of course, the peanut butter is an all natural one with no added preservatives or added sugar. Let’s take a look at these components to get an understanding of why this is part of a heart healthy diet. Apples are definitely still, as they have been for many years, one of the best foods to keep a person healthy. The combination of fiber, pectin and all of the phyto-nutrients a whole apple contains is the key to all the natural benefits, including being part of a heart healthy diet. Most people wouldn’t think of eating peanuts, or a healthy peanut butter, as part of a heart healthy diet, but it should be. Here are the reasons why: Peanuts are a healthy fat, we all need fats, so choose healthy fats. Numerous studies have shown that peanuts are one of the healthiest sources of fats we can consume. The fat content of the peanuts helps to lower LDL’s, the bad cholesterol, increases the HDL’s, the “good cholesterol”, and lowers triglycerides too. Peanuts supply mono-unsaturated fatty acids, MUFA’s, and a diet high in MUFA’s can help prevent coronary artery disease. Peanuts can also help reduce your risk of a stroke, again, because the MUFA’s help prevent coronary artery disease, but also because peanuts contain high levels of Resveratrol, an anti-oxidant. Resveratrol also helps prevent damage to the systemic arteries from high cholesterol. And another heart healthy benefit of Resveratrol from peanuts is reduction in the vascular system from angiotensin, a hormone that increases blood pressure, which is damaging to the heart. Now, think about all those heart healthy benefits from the apple and the peanuts! And, really, this is an absolutely super lunch to keep your heart healthy diet.